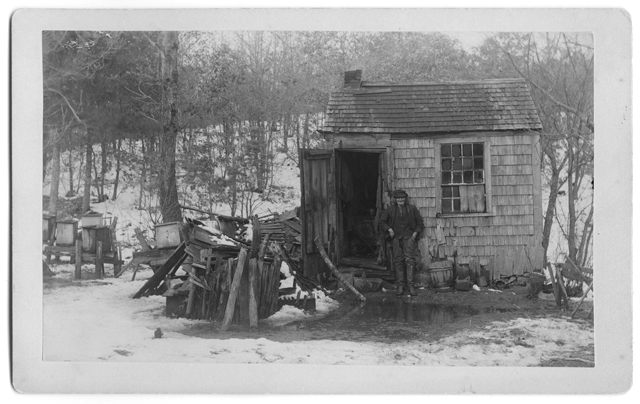 here’s the story of Kingston’s famous hermit, drawn from a cabinet card, a few entries in town records, a newspaper article, a hand-written rebuttal and an anonymous letter. Vital records provide the bare bones of biography: Daniel Weston Fuller was born to Consider and Hannah (Eaton) Fuller on January 5, 1812 and died of pneumonia on June 7, 1894, the year after his story was published in the Boston Journal. After moving out of the hogshead, Dan lived in a 12’ x 6’ hut, a former shoe-shop on Wapping Road later moved deep into the woods between Elm Street and Ring Road. He kept count of snowstorms with tick marks on one “greasy black” wall, and the number of mice caught on another. He festooned his small room with garlands of duck egg shells. What money he earned came from bounties on crows and woodchucks, once netting $17 for 34 heads, or from ducks brought to town, “really very nice if disassociated from the grimy hands that brought them.” His sustenance came from the forest, though in his later years, he did accept food, wood and tobacco from friends. The reporter noted that the hermit’s “piercing black eyes” turned sociable when presented with a gift box of fruit and bread. The last document is a semi-anonymous letter dated February 6, 1935, from Katie in Canton to her Aunt Addie recounting Roger’s memories of Dan the Hermit, including the well-told tale that he never washed. There is not much more detail, but the letter does show that the hermit’s story was still in living memory more that 30 years after his death. As late as 2003, the foundation on which Dan’s “rude hut” sat could still be seen, deep in the woods of Kingston. Those stones, along with a yellowed clipping, a two page recollection and a single letter are all that remain to tell the tale. *Emily Fuller Drew, who transcribed the article in 1938, believed it was written by Elroy Sherman Thompson, newsman, editor and publisher of the Kingston News. Sources: Vertical File: Dan Fuller; Town Clerk’s Reports; Vital Records of Kingston to 1850. 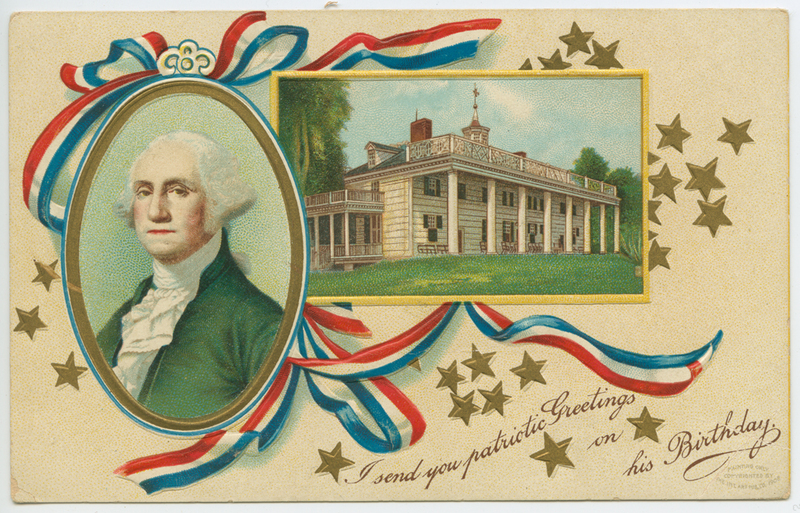 From the chock-full-of-holiday-goodness of the Loring Postcard collection.